- Hi, I gave a glimpse at your bio and saw you formed the band in the 90s but the debut is only dated 2013. Did you split up in the meantime, or did you just play live occasionally without investing much time in composing? Can you write a short history of the band and let us know in what other bands you played or are playing at the moment? - Hi, yes, the band was formed in 90s, gathering together friends of the school. We played a lot, composing and performing live. Then, as usual in the stories of groups of friends, friendships ended for several reasons, different opinions, jobs, no more time for the music and so on, and I remained alone with my ideas and my music. 8 years ago I met Giorgio the singer and Guido the bass player. At the drums was Damiano Malvi. With this band we started to realize new songs, among which there were the embryos of some of Verso Est’s songs. We performed live in many of the places here in Rome famous for rock music, but just before thinking to record the album our drummer got an accident on bike and left us. From that moment we had some new drummers until 2013, the years of the album Verso Est, when we met our new drummer Giorgio Ottaviani. 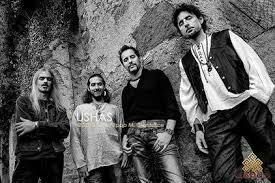 Ushas is a really rock’n’roll band, a funny live and “on the road” band, but we work hard, we spend a lot of time on realizing the songs in the way just fits for our concerns of music, so there’s no much time to spend with other bands or other projects, except for some tribute bands to have fun or…money when it's really needed!!!!! - How old are the songs and were they written and arranged in different periods of time? I really like the balance between old 80s elements, the tampura arpeggio, the screaming vocals, the catchy refrains and the squealing virtuoso guitar solos, the electronic inserts in a couple of songs and the global effect that doesn't sound like a cliche; indeed everything sounds fresh and the drums were recorded in a thick, heavy, punishing way the way I like. Was it your choice or a hint by the producer and the label to satisfy fans closer to Hard and Heavy? Finally, what was the vibe in the studio? - Some songs, like “Verso est”, “La via della seta” and “Dai tetti di Gaden” are really old songs, I wrote them during the first period of the band. I used to think to the band as a sort of hard-blues-psychedelic strange music thing, and it was really funny! Many of that elements remain in my blood, fused today with more modern musical views linked too to the experiences of the other members of the band. Our sounds goes from the 70s until…tomorrow, ahahah, and this, I think, is a sort of seals in recognizing our music. 70s rock (Zappa, Purple, Zep, Grand Funk and so on) and heavy metal are unavoidable heritages of our experiences as music listeners, but fortunately we love be bop too, the blues of classic and contemporary musicians, classic music and Italian opera and so on, giving so to ourselves chances to recreate our world thanks to many languages. It was natural in this way to reproduce all this in the studio, recording the album. The sessions were very creative and, even if we consider ourselves above all a live band, we found in the studio recording many interesting incentives, sometimes a new sights on the composition mode, and for this we have to thank too our producer Gianmarco Bellumori from Agoge Records, who, during some funny sessions, played drums to help us while we were waiting for the new drummer!!! - Is “Verso est” a concept album? - The album Verso est is not a concept album; in the lyrics I wrote two are the main themes, the idea of a journey, inside our conscience and outside in the world as a metaphor of our interior life (all this based on the view of oriental philosophy, above all indo-tibetan Buddhist). By this maybe we could also affirm a sort of “concept”, but there’s not a theme alone for all the songs. - What are your favourite songs off your album and why; what are the weak parts and the strong points in your opinion? - Off the album there are some old and new songs I really like; sometimes we play this material in our new live shows. Among the old is a song named “Hobo”, that talks about a hobo (travelling free people in America that leaves behind every richness or comforts, just to walk more road as possible and to know about everything as to be known) who travels in a train by night (obviously in an outlaw way) and that at the end is being killed by the police in an attempt to stop and catch him. The song is based on a Jack London novel, “The road”, and on the works of famous great writers as Jack Kerouack and the likes. A new song is “In nome di”, that speaks about a sniper who, in the moment of his turn to being killed, no matter to which religion or political belief he adheres to,simply starts to realize that probably his motivations were a big mistake, too much innocent blood on his hands, but now is too late. It is a sad thought on the social situation of this historical moment. - Could you spend a few words to explain your CD cover and the meaning of the video 'Desperados'? Who had the idea of the front artwork? Where did you shoot the video and who is the director? I think the effects are very realistic and the editing is perfect! - The cover of the album should represents our idea of goddess Ushas, the Indian vedic goddess of the down, it was realized by Valentina Pinto, an artist who is now working by the Marvel Comics. For what concerns the video of “Desperados”, the story shows a sort of witch hunting by some strange bounty killers (us) endowed by musical instruments as weapons. The man who pays us for the hunting, a sheriff, in reality will show himself as the real witch and the battle will end with no good for us. We shot the video in an abandoned factory, we spent some days literarily in dust and mud, ahahahah, but the director’s choices were perfect, and the post production has been really imaginative, as you can see now in the video. Thanks to this, the video has won the first prize in the videoclip section of a quite famous Italian film festival, the Camaiore Film Festival, so once again we have to thank the directors Mirko Vigliotti, Giancarlo Vasta and all the artist of the GetUp Pixel Group! - I see you have a mighty and capillary distribution of your debut album; how's the response been so far? What countries have been more receptive as of yet? Have you received any negative comments? How'd you get in touch with your label? Did they make the first contact or did you approach them after a live show or by submitting them some songs? - ‘till now we were very lucky with Verso est, because no negative comments at all have been spread from magazines or other media, the album has been really appreciated and for us it is a great joy, also because the singing is in Italian, and we were afraid that outside Italy this choice would be difficult to accept! But “Verso est” has been distributed in lots of countries as England, east of Europe, United States and south America; we know a dj of Santo Domingo spent very good words in his radio show about our songs, ahahahahahah, a good chance to have a new friend and…and maybe a new friend who guests us in his home for our next holyday, ahahahahahah. With our label we have a good professional relationship and a responsible friendship, and the history of the album Verso est started just thanks to Gianmarco Bellumori who, at the beginning of his adventure as a producer, wanted us as his first band to realize a good album for Agoge Records! - Why isn't Stefano Rossi your permanent drummer? His performance is excellent! Also did he have the opportunity of composing something or was he just employed as a mere sessionist? 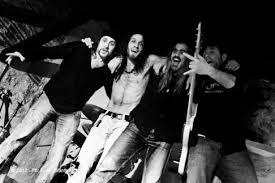 - As I wrote before our permanent drummer is Giorgio Ottaviani; Stefano Rossi is an excellent drummer (now playing with the heavy band W.h.i.p.) and a very good friend of the band. 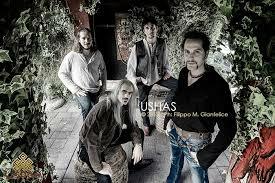 He played some years ago as Ushas drummer too for some periods. He helped us while we were looking for a new drummer, and recorded the tracks when we were getting in touch with Giorgio for the first time, really he didn’t play any role in the composition of the songs, but without him we should have had to wait, who knows, how long before releasing Verso est!!! - Where did this interest about Buddhism appear? Were you an unsatisfied Christian who couldn't get the answers to life's questions and turned to Buddhism to approach life differently? Can you feel comforted by your Master Siddharta Shakyamuni's teachings even in this world where the unfair, the greedy, the strong and the sly seem to win on the meek, the weak and the righteous? Why did you decide to call your band with a Vedic deity's name and dedicate most of your lyrics? - I traveled a lot in India, in Nepal too, for my academic studies and career, ‘cause I study and teach Tibetan Buddhist philosophy and history of art, so my interests were easily jointed to my passion for travelling and music. Really I never intended to create a Buddhist band, ahahahah, too boring, I don’t want to be a prophet or something like that and I’m not so special after all, ahahahah, but obviously my view of life is reflected in my songs, and I think that, with no need to convert anyone to anything, some experiences are simply too natural and genuine, to not try to share them with other people, different people, people who in turn could have something to tell me. It’s just this. Ushas is not a Buddhist deity (in reality Buddhists don’t pray any gods, and the famous Tibetan tantric deities are just symbols of the archetypes of our emotional states), but I really loved her meaning, for she represents a new starting point, when the night is gone and the day still has to show his warm face, and, at the same time, a new starting point implicates of course a new end. It is the story of our life, full of ends and new beginnings! - Your website doesn't show concerts planned for 2015. Please inform your fans about your next shows. Are your next live dates including gigs abroad, too? Do you prefer clubs or open spaces such as festivals to play? Do you feel your music and lyrics enjoyed and understood live or is the domestic listening the ideal situation to fully appreciate all of Ushas's aspects? Where would you like to play besides a stage? - Well, we are programming some gigs for 2015, especially out of Rome, we’ll update soon the calendar of concerts. We are a live band, so we like to adapt to every kind of live situation, in a festival we can count on a large audience to sing to, jump with to partecipate the show; in a club we could count on a more intimate atmosphere with the audience closer to us. We don’t think at a particular situation for us, we try to do the best of us for the sound, the crowd and a successful and thrilling show. - What are your worst bandmate habits? - What's the most played album in your van? 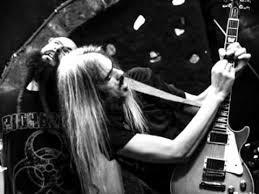 - We hear a lot of different albums, the most listened to are Deep Purple in Rock, Frank Zappa’s Hot Reds and Led Zeppelin IV also passing a few contemporary bands or some of our new discovery , such as Texas Hippie Coalition or the new psychedelic band Causa Sui. - What not Metal artist or band would you like to collaborate with? - Certainly we would play with Franco Battiato, an historical Italian artist, for his great musical genius and experimental lyrics. He works so much on the musicality of his lyrics and the images that they create, for us he’s a point of reference. - Shall we have to wait long for your next album and is it going to be released by Agoge recs again? Is it going to include more songs with other Tibetan or Hindu traditional instruments? - Currently, with great patience of our producer, we are working on our new songs that will include even oriental instruments!!! - In December 2013 we opened the concert of Paul Di'Anno, the first singer of Iron Maiden, in Rome. There were a lot of people and we didn’t know what to expect. Due to a technical problem we did a sound check of 3 minutes, moreover, our singer was sick, it didn't seem to be the best of our gigs. We had to play 25 minutes in opening, we were reserved a little space on the stage in line on the border, and 700 people were standing in front of us waiting only for their singer, ignoring who we were. We decided to do the best show we can and let it go, just have fun…On the third song, Desperados, that we start with crowd singing, every person in the club was singing, that was impressive!!! It was one of our best shows! - Has your relation to playing changed in the years? I mean, when you're young you play music or write songs because you're into it but at the same time you don't take it seriously, you don't truly think of business and the likes in a professional way; on the contrary, after 20 years it becomes more of a job, cos you have wife and kids and you have to schedule your commitments to find the time to rehearse, play, record and that's why not so many bands (besides the big names that made history) last so long, many of them just lose touch with the scene and become not relevant and often quit. How can you keep the flame alive inside you and not detach your heart from Rock? - We are now a sort of little family, and we became this during years, creating music, facing joys and pain. Every problem, of every kind, has always been resolved thanks to our patience and passion, confronting ourselves in the dilemmas. After many years of playing together we know each other well and everything is more simple. Rock and brotherhood are the two things that keep the flame alive, moments of difficulty or sadness, we know, can be found in every family, but we learnt how to overcome all this! - Lastly, what's the secret to happiness and serenity in your heart in this troubled society? - Consciousness! We criticize so much modern society in our lyrics, offering an opportunity to think over solutions, and the solution is not a secret, keeping alive consciousness with awareness we can find serenity.